"we must abandon the notion of fixed laws when it comes to living and conscious systems." "For a living object, the state of the whole defines the state of the parts, but not vice versa. That is why the entropy of a living system does not increase according to the second law of thermodynamics." "and when you observe a system the observation turns your consciousness and the system into a combined system. This does does not necessarily lead to a collapse. Now, the collapse happens when the observer records his impressions in verbal form – thoughts, – because in so doing he destroys the coherent superposition and makes it into a single information state of his consciousness, which corresponds to a definite pattern of neural activity. If we could prevent somehow the observer from verbalizing his impressions, we could use him as a storage media, thus avoiding the collapse of the wave function." G.N. Dulnev. Energoinformational exchange in Nature. Iva, St. Petersburg, 2000. G. Fauconnier. Mental spaces. MIT Press, 1994. L. Ingber. Statistical mechanics of neocortical interactions. Dynamics of synaptic modification. Phys. Rev. A, 28(1):395–416, 1983. A. Khrennikov. Classical and quantum mental models and Freud’s theory of unconscious mind. V¨axj¨o University Press, 2002. R. Landauer. The physical nature of information. Physics Letters A, 217(4): 188-193, 1996. K. Nadreć. 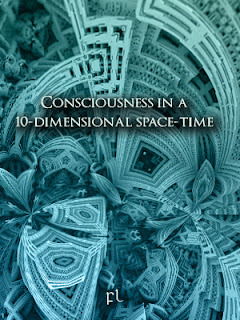 The dimensions of consciousness. Iva, St. Petersburg, 2009. Y.F. Orlov. The wave logic of consciousness; a hypothesis. Int. J. Theor. Phys., 21:37–53, 1982. E. Smith. Thermodynamics of natural selection: Energy flow and the limits on organization. Journal of theoretical biology, 252(2): 185-197, 2008. M. Tegmark. The importance of quantum decoherence in brain processes. Phys. Rev. E, 61:4194–4206, 2000. S. I. Walker and P. C. W. Davies. The algorithmic origins of life. J. R. Soc. Interface, 10(79): 20120869, Feb 2013. G. Whitesides. The improbability of life, volume 1. Cambridge, UK: Cambridge University Press, 2012.